17.1.1873: Completed by John Gibson, Fleetwood (Yd.No.19) for David & John Moss, Fleetwood as King David. Registered at Fleetwood (FD93). 1.1.1875: Owned by David Moss, Fleetwood. 1881: Census at Fleetwood – William Moss (27), b-Southport, master fisherman; Thomas Hallsall (50), b-Southport, mate fisherman; John Smith (22), b-Southport, fisherman; John Eaves (24), b-Fleetwood, fisherman; Robert Hallsall (19), b-Fleetwood, cook. 22.10.1887: Sold to John Moss, Fleetwood & others. 25.11.1896: Sold to William Moss, Fleetwood. 8.5.1906: Sold to John Hamlet Fogg, 35 Pharos St, Fleetwood (managing owner). 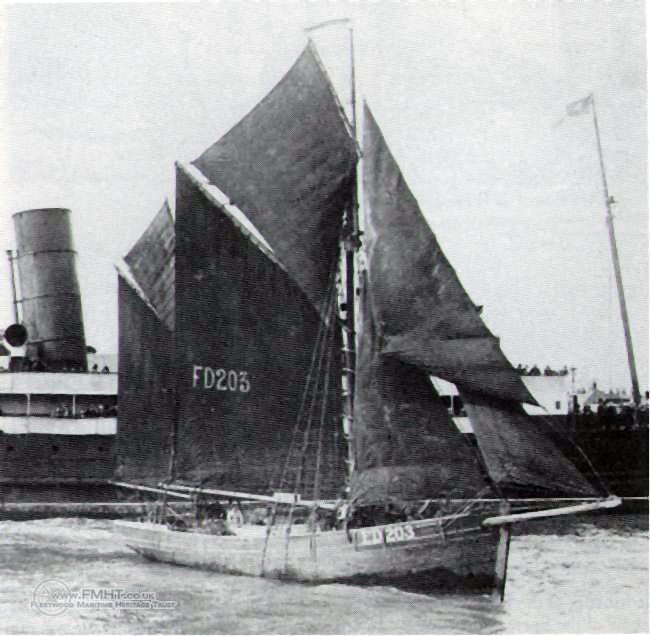 19.4.1911: Holed after collision with steam trawler CYGNET (FD110) near ferry slipway. Beached on Knott Spit. 30.8.1917: Sold to James Myerscough, Knott End for demolition. 9.3.1918: Fleetwood registry closed “Vessel broken up”. This entry was posted in Sailing Trawlers and tagged David & John Moss, David Moss, Jigger Smack, John Gibson, John Hamlet Fogg, John Moss, William Moss on February 18, 2009 by Fred Smith. 1874: Completed by Peter Rawstrone, Freckleton for J. Randles, Fleetwood as DESDEMONA. 2.7.1874: Registered at Fleetwood (FD127). 1.1.1875: Owned by Philip Turner, Fleetwood. 1.1.1880: Owned by David Moss, Fleetwood. 1.1.1883: Owned by John Moss, Fleetwood & others. 24.10.1887: Sold to ? ?, ??. 1.1.1888: Owned by John Moss, Fleetwood. 8.5.1902: Registered at Liverpool (LL353). 10.11.1902: Sold to Jeffrey Wright (64/64), 73 Kemp Street, Fleetwood (managing owner). 13.11.1902: Registered at Fleetwood (FD203). 19.3.1903: Sold to Alice Marquis (64/64), 63 New Road, Blackpool. 23.3.1903: John Rimmer, 30 North Street, Fleetwood designated manager. 12.6.1906: Sold to Richard Ashcroft, London Street, Fleetwood. 20.6.1906: Richard Ashcroft designated managing owner. 9.7.1909: Shares (32/64) sold to John Rimmer, 6 North Church Street, Fleetwood. 21.8.1918: John Rimmer shares (32/64) sold to Richard Ashcroft, Devon House, Blakiston Street East, Fleetwood. 9.9.1918: Shares (32/64) sold to H. B. Shepherd, ?? 11.2.1920: Sold to John Shippen & Thomas William Dixon, Whitehaven. 26.1.1922: Fleetwood registry closed. Transferred to Whitehaven. 05/01/2009: Page published. 3 updates since then. 21/12/2017: Removed FMHT watermark from image. This entry was posted in Sailing Trawlers and tagged Dandy, David Moss, Jeffrey Wright, John Moss, Philip Turner, Sail on January 5, 2009 by Fred Smith.